Yeah for the evolution of the species! Hah, didn't think of that. Thanks for the link. I first read about Wallace in James Hansen's book - Here on Earth - A Natural History of the Planet which is my favorite Hansen book of so far, though there is one more on seaweed that I think I am going to like. Alfred Russel Wallace was a contemporary of Darwin. He came up with the theory of evolution at the same time or a bit earlier actually, but his work was not accepted by the Victorian elite. Wallace's later theories were similar to Lovelock's on Gaia. Lovelock came up with his independently according to Hansen. British humanist, naturalist, geographer, and social critic. He became a public figure in England during the second half of the 19th century, known for his courageous views on scientific, social, and spiritualist subjects. 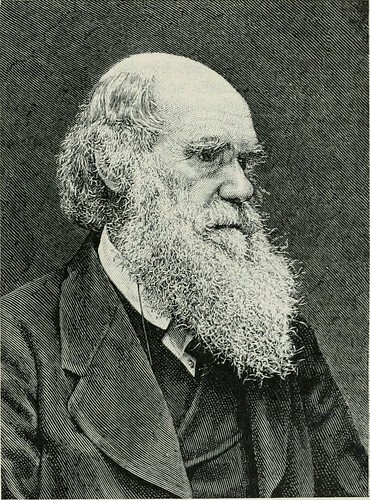 His formulation of the theory of evolution by natural selection, which predated Charles Darwin’s published contributions, is his most outstanding legacy, but it was just one of many controversial issues he studied and wrote about during his lifetime. Wallace’s wide-ranging interests—from socialism to spiritualism, from island biogeography to life on Mars, from evolution to land nationalization—stemmed from his profound concern with the moral, social, and political values of human life. well just thank you for bringing this up! Good morning, magi. Thanks for reading. Have a good one. stop procrastinating and publish his "origin of species". They were in communication throughout that period. and Australian origin is present. Wallace noticed this clear division during his travels through the East Indies in the 19th century." One of the meanings has to do with change in a certain direction, usually "higher" in some sense. From Miriam Webster: "a process of continuous change from a lower, simpler, or worse to a higher, more complex, or better state : GROWTH". This is completely wrong when we are talking about Darwin's evolution. This is a better definition:"descent with modification from preexisting species : cumulative inherited change in a population of organisms through time leading to the appearance of new forms : the process by which new species or populations of living things develop from preexisting forms through successive generations" again from Miriam Webster. In this definition there is no inherent "direction". This principle was understood by Darwin but is poorly understood today, especially with bastardized forms talking about "social evolution", or "survival of the fittest". Evolution produces species that are more survivable in the given ecological habitat. Evolution occurs in groups, or gene pools. Many of Darwin's and Wallace's findings were quite subtle and easily misunderstood. For instance there is very good evidence that raw intelligence is a negative factor for longevity of survival of a species. It seems that just enough intelligence to function is the right amount. We are clearly way over the limit. Our cousins in the hominid-like families could have easily evolved larger brains, but past some point of intelligence there is a negative selection pressure. There is a specific reason that h.Sapiens developed larger brains and more intelligence. There are many theories, but the one that I like the best is that it was necessary for specialization of labor. It seems clearly though that this is a short lived branch of the family tree of evolution. Another characteristic of evolution that folks don't talk about much, but was well understood by Darwin is sexual selection. Instead of waiting for a small natural selection pressure to evolve a group, it is much faster for mating individuals to select for certain characteristics, much much faster. There is some thought that most of the characteristics that we call human were created by sexual selection, not natural selection. That would include bipedal, intelligence, sexual body forms, physical body forms, sexuality, music, art, and lots more. Perhaps the choices, even fads, of women in early society for their mates is responsible for most of our characteristics. There is also a lot of arbitrary genetic baggage hanging around. it shows especially strong if a gene pool narrows down to a small number of individuals and then later grows. Species that multiply quickly, bacteria and viruses, are very modern and have little baggage. We are an old genetic species and therefore not very modern. Again contrary to the thought that we are the apex of evolution. We behave outside of the normal limits of a complex habitat. It is inconceivable that mankind can survive, as we violate the basic concept of co-evolution of species within a habitat. The the only way for mankind to exist on this planet compatible with existing species and habitats, is to tread very lightly, to the point that arriving from outer space you would barely perceive that there is an intelligent civilization here. That's the goal. people don't get at first is that a trait which may be a beneficial adaptation in a specific time and place may be less beneficial elsewhere and/or elsewhen, which alone is sufficient to destroy the idea that it is directional. In addition, a cluster of traits, mostly maladaptive, can survive if they are clustered with one or two strongly adaptive traits, so the persistence of a given trait means nothing, individuals survive and procreate, not isolated traits. Darwin concludes that "there are few animals which have played so important a part in the history of the world than the earthworm" but 136 years later we still don’t know how many and what types of earthworms there are in gardens and other green spaces such as allotments, school grounds and parks. By taking part in Earthworm Watch you can follow in Darwin’s footsteps and contribute to earthworm science. Amazing what the lower classes (of animals, plants, and people) will help you understand. Good morning, Lookout, thanks for the info. I can't recommend enough "The Beak of the Finch" (1994) by Jonathan Weiner, won a Pulitzer. Much is about the research of the Rosemary and Peter Grant, the couple of research scientists at Princeton that have worked with the Darwin's Finch group on the Galapagos for decades. It is one of the best modern works on the subject for its melding of technical aspects with its simplicity to read and understand.